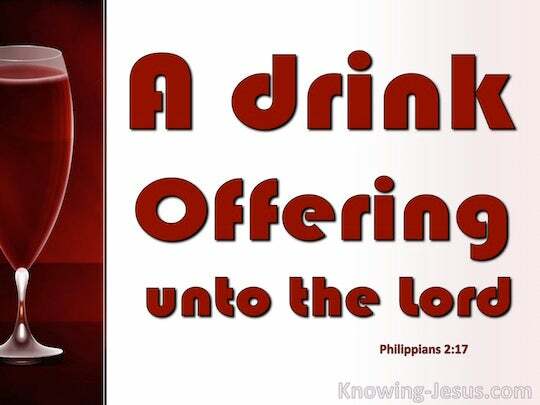 ﻿ Philippians 2:17 But even if I am being poured out as a drink offering upon the sacrifice and service of your faith, I rejoice and share my joy with you all. Yet even if I am being poured out like an offering as part of the sacrifice and service I offer for your faith, I rejoice, and I share my joy with all of you. Yet even if I am poured out a libation upon the sacrifice and service of your faith, I am glad and rejoice with you all. But even if I am poured out like a drink offering [See Ex. 29:38-41] on the sacrifice and service produced by your faith, I am glad and will rejoice with all of you. [Note: Paul here likens the possible pouring out of his blood to the wine and oil of the Old Testament sacrifice, which is then likened to the Philippians' faithful service to God]. But if I am poured out on the sacrifice and service of your faith, I rejoice, and rejoice with you all. 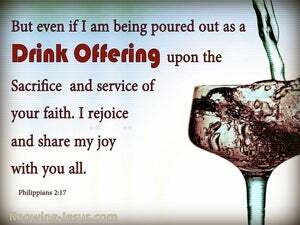 But even if I am being poured out as a drink offering upon the sacrifice and service of your faith, I am glad and rejoice with you all. But if also I am poured out as a libation on the sacrifice and ministration of your faith, I rejoice, and rejoice in common with you all. And even if I am poured out as an offering upon the sacrifice and service of your faith, I joy and rejoice with you all. But if also I am poured out upon the sacrifice and service of your faith, I rejoice, and rejoice together with you all. 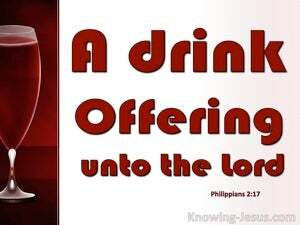 But even if I am being poured out as a drink offering on the sacrifice and service of your faith, I rejoice and rejoice with all of you. Yea, and if I am offered upon the sacrifice and service of your faith, I joy and rejoice with you all. Yea, and though I be offered up upon the offering and sacrifice of your faith: I rejoice and rejoice with you all. Even if my life-blood has to be poured as a libation on the sacred sacrifice of faith you are offering to God, I rejoice, I congratulate you all ? ?18 and you in turn must rejoice and congratulate me. But even if I am being poured out like a drink offering on the sacrifice and service of your faith, I am glad and rejoice together with all of you. But if I am even poured out on the sacrifice and ministration of your faith, I rejoice, and rejoice with you all. Yea, and should I become the victim, in the sacrifice and service of your faith, I joy, and rejoice with you all. And if I am even offered upon the sacrifice and service of your faith, I joy, and rejoice with you all. Nay, even if my life is to be poured as a libation upon the sacrificial offering of your faith, I rejoice, and I congratulate you all. But if I be even poured forth as a libation on the sacrifice and service of your faith, I rejoice and congratulate with you all. 16 holding fast the word of life, so that in the day of Christ I will have reason to glory because I did not run in vain nor toil in vain. 17 But even if I am being poured out as a drink offering upon the sacrifice and service of your faith, I rejoice and share my joy with you all. 18 You too, I urge you, rejoice in the same way and share your joy with me.